The review "Médicine Tropicale", published today by the Institute of Tropical Medicine of the Military Health Service, is the product of a long scientific tradition and recounts the History of discoveries in the world of the tropics. In 1863, after the publication of Brassac's thesis entitled "Considérations pathologiques sur les pays chauds" (Montpellier 1861), Chasseloup-Lantot, Minister for the Navy and the Colonies, gives permission for the creation of a review, "Archives de Médicine navale" which will be published during 25 years, the issues dealing with naval hygiene, pathology, ethnology, medical geography, completed with an official bulletin on the transfers and movements of Health Service officers. In 1890, the troop of Health Service Officers of the colonies and the countries of the protectorate is created beside that of Naval Physicians. This will justify the appearance of a new journal, "Archives de médicine navale et coloniale" which will publish, from 1890 to 1896, works that are of as much importance to physicians and chemists on duty at sea as to those in the colonies. Gradually the specificity of each health service asserts itself. The time has then come to recognize the field of specialization and the centre of interest of each publication. Thus "Archives de Médicine Navale" takes again its original title in 1897 and until 1909 when it becomes "Archives de Médicine et de Pharmacie Navale", then "Revue de Médicine Navale" (1946-1959). Similarly, in 1898, "Les Annales d'hygiène et de médecine coloniale" appears. Its publication will be interrupted from 1914 to 1920 and it will be re-born under the title of "Annales de médicine et de pharmacie coloniale" and the publication suspended again from 1939 to 1940. By a decision dated 22nd April 1941 under the aegis of the Secretaries of State for war and the colonies, a review of the Health service of Colonial Troops is created, of a strictly scientific character and specialized in questions of exotic pathology. This review is published in Marseilles under the direction of the School of Applied Medicine of Colonial Troops. The first issue of "Médicine Tropicale" came out of the printing presses of the Leconte printing works of Marseilles in June 1941. Created in order to be, at the same time, a medium of expression for physicians and chemists of the colonial troops, a means of continual training and of contact between members of the Health Service, "Médicine Tropicale" publishes, for more than thirty years, reports and original works, communications, bibliographical documents, but also the questions set in competitive examinations (concours) as well as administrative and cooperative information. The contingencies attendant on a monthly publication and the difficulties of the time rapidly lead to the adoption of a longer lapse between issues. "Médicine Tropicale" is published every two months from 1943 and continues thus with - during certain years - special supplementary issues. The review maintains the same style of presentation until 1974. During these thirty years there appear reports of very remarkable accomplishments. We can mention the works of Bouvier* and Autret* on Nutrition in Indochina (1942), those of Puyuelo* in 1949 on Onchocercosis in Black Africa, those of Gallais* on experimental Trypanosomiasis and of Reynes on insecticides, both published in 1953. We must also mention Lapeyssonnie* on cerebrospinal Meningitis, Carayon* and Bourrel* for their work on Leprosy, Labusquière* and the vaccination against measles and many other achievements. 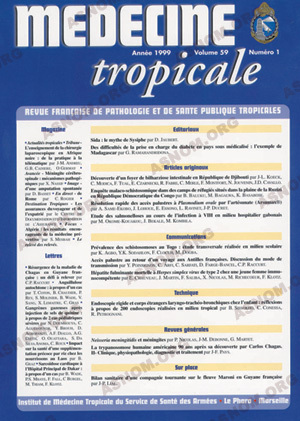 It is in 1975 that "Médicine Tropicale", already subtitled "Revue de médicine et de santé publique tropicales" and no longer "Revue du Service de santé des troupes de marine" takes on its present appearance after wide-ranging renovations : the cover altered, an effort made to select articles rigorously. But the journal preserves its polyvalent character, which distinguishes it from other French periodicals specialized in tropical medicine. International readership increases. At the same time, 40 % of the authors are drawn from the milieu of tropical civilians and include many African physicians and academics. Besides the standard issues, the review also publishes special issues devoted to particular themes concerning one tropical disease or a group of them. "Médicine Tropicale" is at present distributed in eighty countries, contributing towards the propagation of French medical thinking over the five continents. Thus for 116 years, physicians and chemists of the navy, colonial troops, overseas troops and, at present, troops engaged in providing technical assistance have been able to share their experiences and their work in tropical environments by means of the review. The History of "Médicine Tropicale" is closely related to the French health-improvement effort undertaken by the Colonial Health Service; then, after Independence, to the continuing work of cooperation of the marine troops.